Bring on the New Year – clever decor tips for a trendy house party!! Hope you had a joyous Christmas celebration with your near and dear ones! Can you believe that we are just days away from a brand new year! As we gear up for the biggest party of all – New Year’s Eve Party – we wanted to share a few DIY ideas to make your home trendy and spectacular as you ring in 2012 with your friends. Use these budget conscious ideas to bring in a different color theme from reds and greens while using many of the items that you purchased for past week’s celebrations. Since we did not get snow this Christmas, New Year’s Eve party is a great time to go snowy themed, with touches of blue and brown. Collect all the white and blue colored pieces from your Christmas decorations and be inspired by these ideas as you prep for a grand house party. Entrance area Décor: Gather a bunch of pretty branches in a pot near the entryway and place a few white ornaments and white lights on them. These branches can be white (available at Crate & Barrel, Pier 1 etc., or a store in the flower district) or you can pick up a few well-shaped fallen branches from a near-by park. Based on the size of the branches, be creative in placing white & silver sparkles on them and they will definitely turn out festive and beautiful. 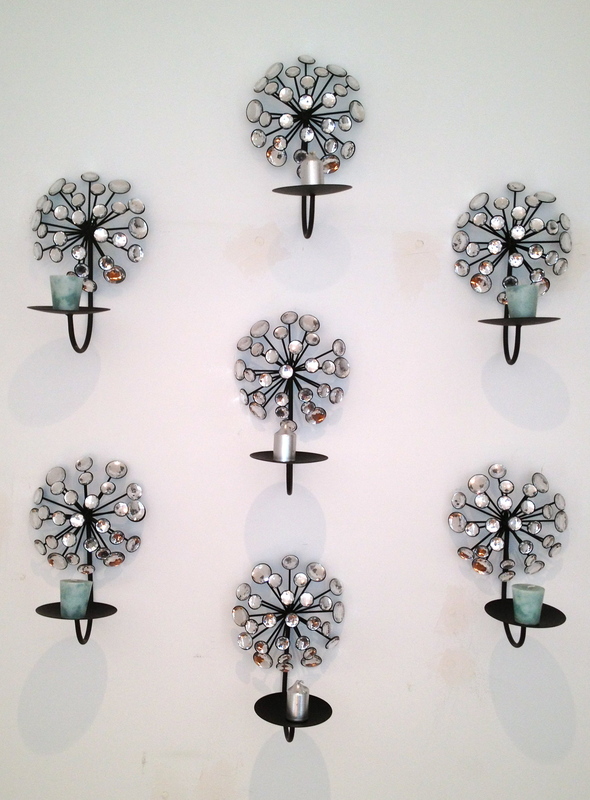 Wall Décor: Use crystal flower shaped wall scones and put co-ordinated candles on each one. It makes an empty wall stand out and will dress up a corner or entrance wall. Ceiling Décor: The bigger white and blue ornaments could be hung from the ceiling and paper flowers or lanterns is a great addition. If you are looking for very inexpensive ones, Party City or Luna Bazaar has cute things you can hang from the ceiling and turn up the decor volume. I personally love the snowflakes & white fluffy decorations. Mix a few blue decorations and the color theme will flow beautifully. Table Setting: A creative space to establish the color theme of silver and blue. Use silver bordered white plates with silvery place mats. Silver and white napkins can be folded over plates to include cutlery. Add more drama with blue flowers or ornament pieces in shot glasses placed on the plates. 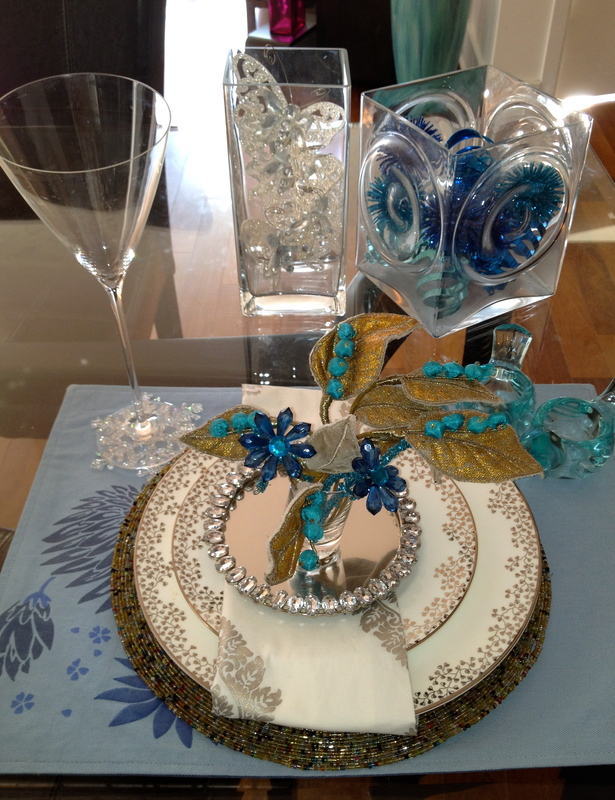 The place setting along with silver snowflake coasters and wine glasses will look grand against a blue tablecloth. Centerpieces: If you don’t want to spend too much on centerpieces, you can take low circular vase or a simple wide bowl and fill it up with white and blue ornaments and some pine cones. If you like to be more creative, another idea is to make a few small pom-poms as floaters. Here is how to make them – You will need tissue paper and 24-gauge white cloth-covered floral wire. 1. Stack four sheets of tissue. Cut a 10-by-5-inch rectangle, going through all layers. Make 3/8-inch-wide accordion folds. 2. Fold an 18-inch piece of floral wire in half, slip over center of tissue, and twist to secure. Trim ends of tissue. 3. Separate layers, pulling away from center one at a time. 4. Bend wire into a loop to fit around napkin, and twist end around loop to secure. Fill a shallow bowl with water and float the pom-poms. For an added touch of elegance, drop a few tea candles or other small candles in the water as well and light them just before dinner, letting them float around the paper flowers. 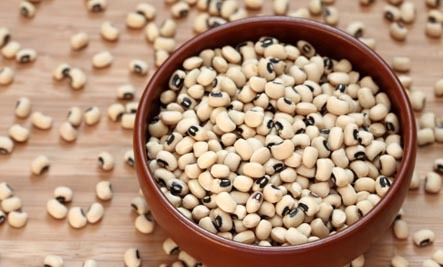 Luck and Lighting – Black-eyed peas are considered good luck on New Year, so why not incorporate those little legumes into your décor in candle holders around the apartment? The peas are very pale and will go well with your color theme as well. Look through your cabinets for a couple mismatched glasses. Fill each glass 1/3 to 1/2 of the way with black-eyed peas, set a small votive or other small candle into each one. You can scatter your candles throughout the party area where you want to add some sparkly. Drink-ware Decor: Champagne glasses are a must for the ball drop moment at your party but wouldn’t it be fancier to dress it up a bit? Here is a clever idea – floaty butterflies. 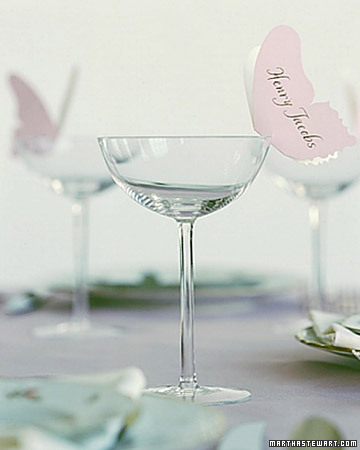 You will need card stock in party color theme, butterfly template, pencil and scissors. 1. Card stock paper that is colored on both sides; fold in half. Place butterfly template on paper with flat edge of butterfly’s body flush against fold; trace. 2. Cut out butterfly along inside of the traced line and cut out V-shaped notch along the folded edge. Open slightly. Slip notch over rim of glass to hold butterfly in place. Enjoy the preparation and have a great start to the New Year at your amazing party! May this new year bring many opportunities your way, to explore every joy of life, turning all your dreams into reality and all your efforts into great achievements. Happy New Year to you & your loved ones.